recently i spent a lot of time building a chicken coop. i first designed the coop in google sketchup, which took me about 3 days. then spent about 9 full days (9am - 8pm) building it. as with any large project, aspects of the design changed during construction. the wheel mechanism was the most difficult part and it went through about four revisions before i got it working. i originally designed and built the coop in may, and just this last week i built and installed the nesting boxes. the final coop was much heavier and expensive that i imagined. all the materials probably ended up costing my about $700. i've uploaded pictures of the coop design, construction, and our chickens in the finished coop. i've also uploaded the 3-d sketchup model for the coop. 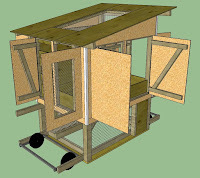 Very useful DIY chicken coop article.